If your mass driver fails in the middle of mining run, remember that your ship is equipped with a Nuclear Thermal Rocket engine. It’s main thrust is more than sufficient to melt any asteroid. This is emergent mechanic. Yesterday I added an exhaust particles for engines. Today I made asteroids split up when hit with sufficient energy. I imagined it will be kinetic energy that breaks up the asteroids, but thermal works just fine. When player blasts asteroid with full thrust, most of them will fracture. There is a lot of tuning possible. 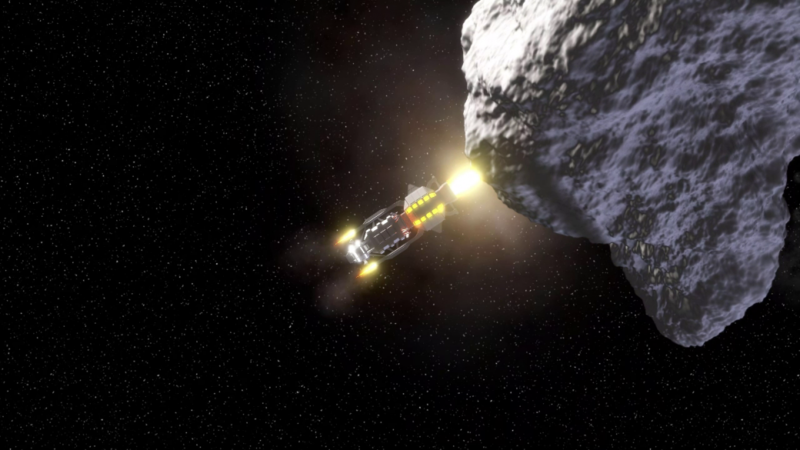 Changing how much energy asteroid resists and how much it needs to fracture can change feel of the asteroid, from solid rock to fluffy snowball. I went for something in the middle, which is both plausible and fun to play. Next stop – mass driver to do some real mining and shooting.